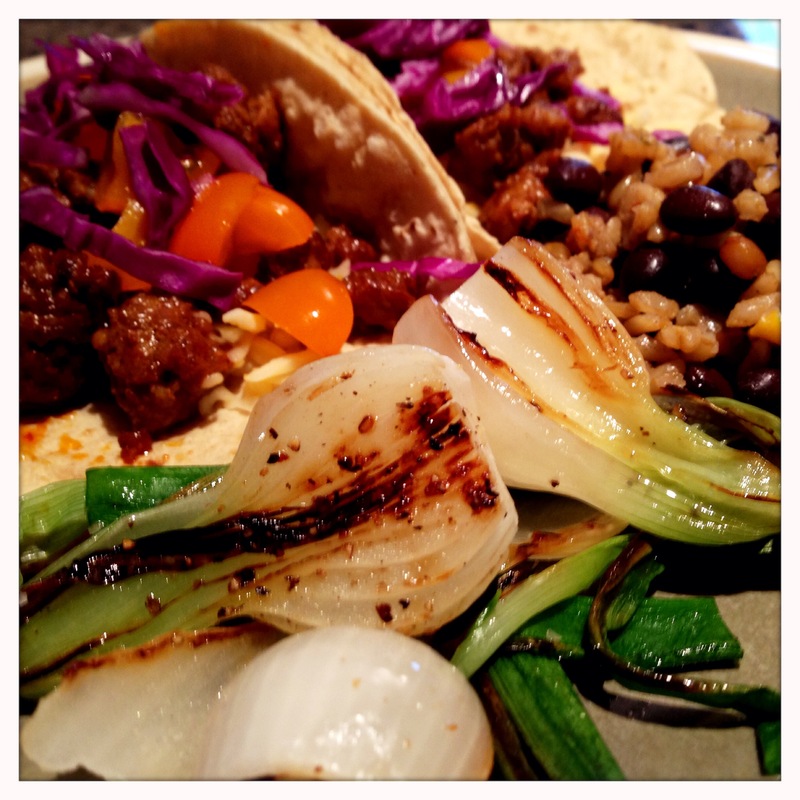 Today, I just have a quick post on some tacos I made recently using one of my all time favorite meats – chorizo. Chorizo encompasses a wide range of Spanish, Portuguese and Mexican sausages, both fresh and cured. 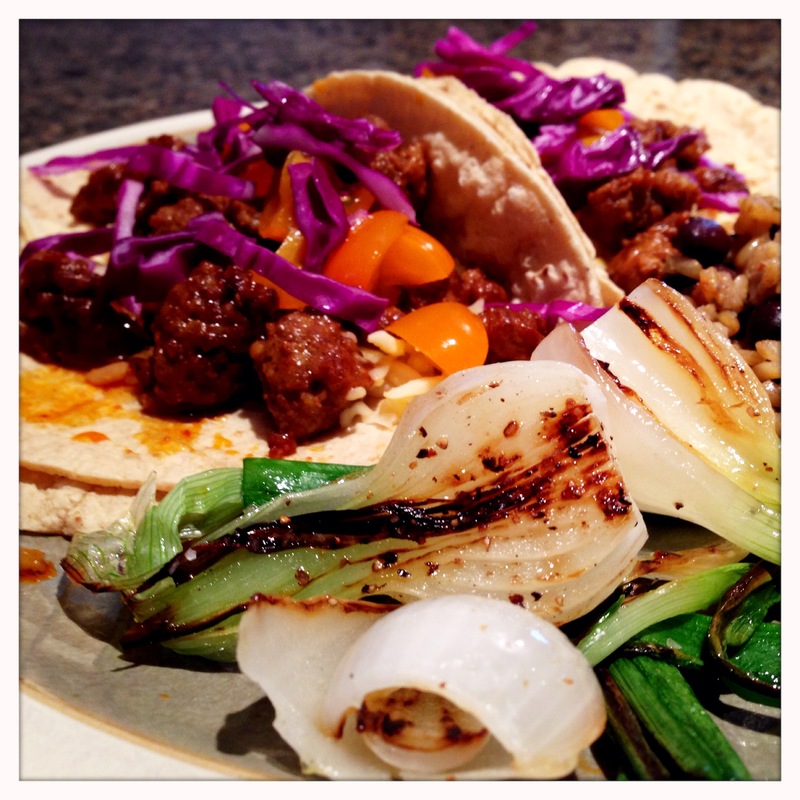 In the case of tacos, we’re talking about fresh Mexican chorizo, a spice raw pork sausage. 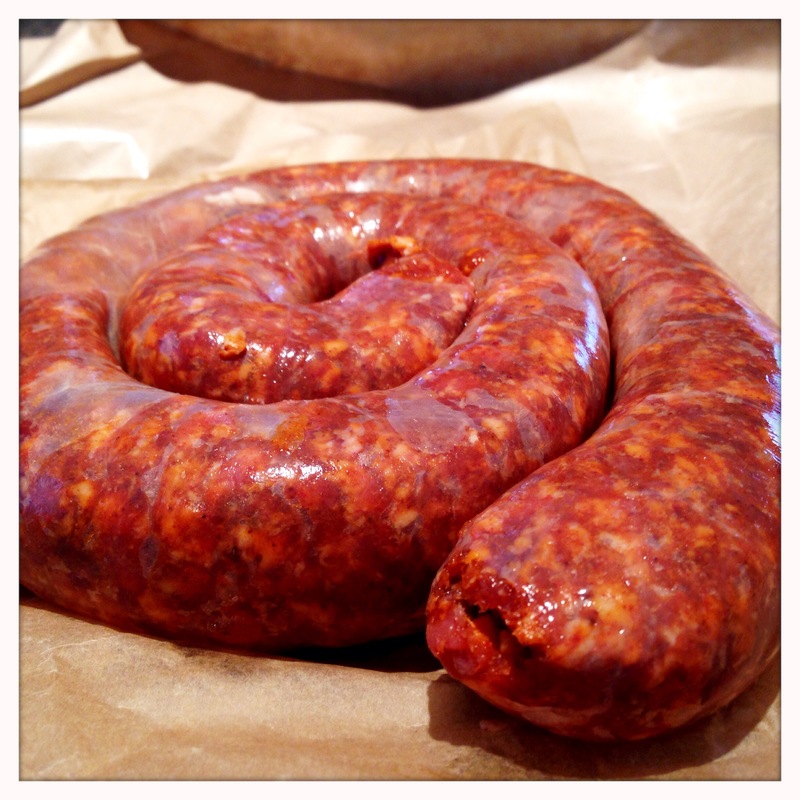 It’s frequently found in plastic tubes in grocery stores, but my butcher shop recently started carrying fresh chorizo in coils, and I couldn’t resist. This fresh, high-quality chorizo is far less oily than the pre-packaged stuff in most grocery stores, and if you can find a butcher or sausage maker that stocks it, I urge you to give it a try. It’s truly amazing stuff. So, now that we’ve got some top notch chorizo, let’s make some tacos! We’ll start by getting the chorizo cooked. While you can cook chorizo whole, we will be breaking it up and cooking it like ground beef in this application. Using a sharp knife, slit the casing lengthwise so that you can easily pull it off of the meat. Then break up the meat, and add the small chunks of sausage to a pre-heated pan. You will not need oil in the pan as the sausage will release plenty of fat to keep things lubricated. Keep the sausage moving periodically while it cooks, and use your spoon or spatula to break up the meat, creating a fine, ground beef-like texture. Do not drain off the oils that release from the sausage as they provide amazing flavor to the meat. Let the chorizo simmer in the the oil once it’s cooked through while you’re getting the rest of the meal ready. 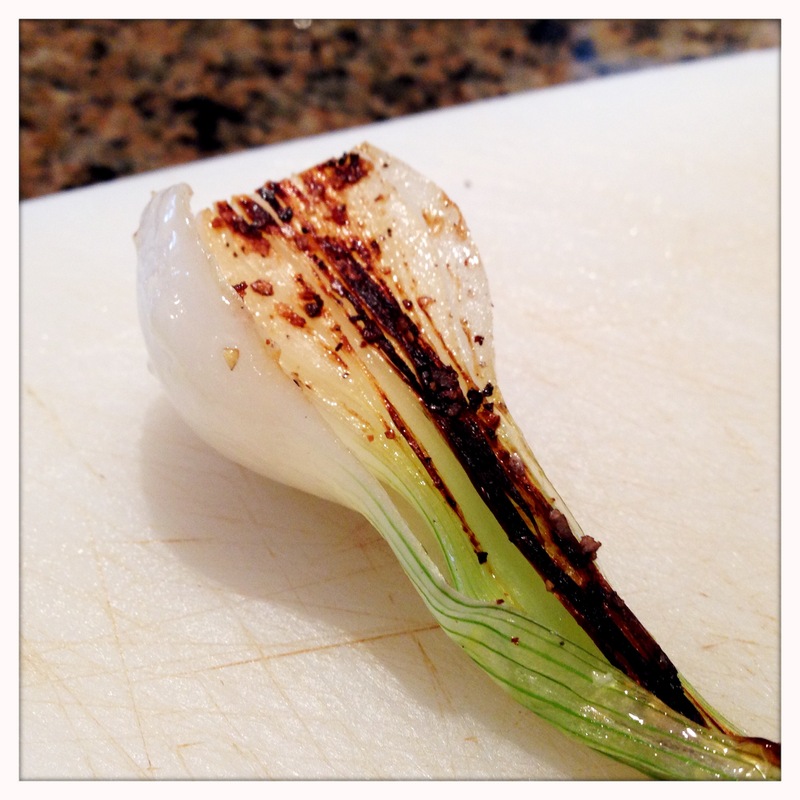 I have, lately, really been enjoying these grilling onions. I have also seen them sold as Mexican onions, and I am not sure what their official name really is. They look like a large green onion with a round white bulb on the bottom. They take very well to high-heat cooking, and have an amazing flavor once they’ve been caramelized a bit. Preparation is fairly simply. Trim off the bottom roots, and slice the onions lengthwise. Coat lightly with olive oil and season liberally with kosher salt and fresh cracked pepper. 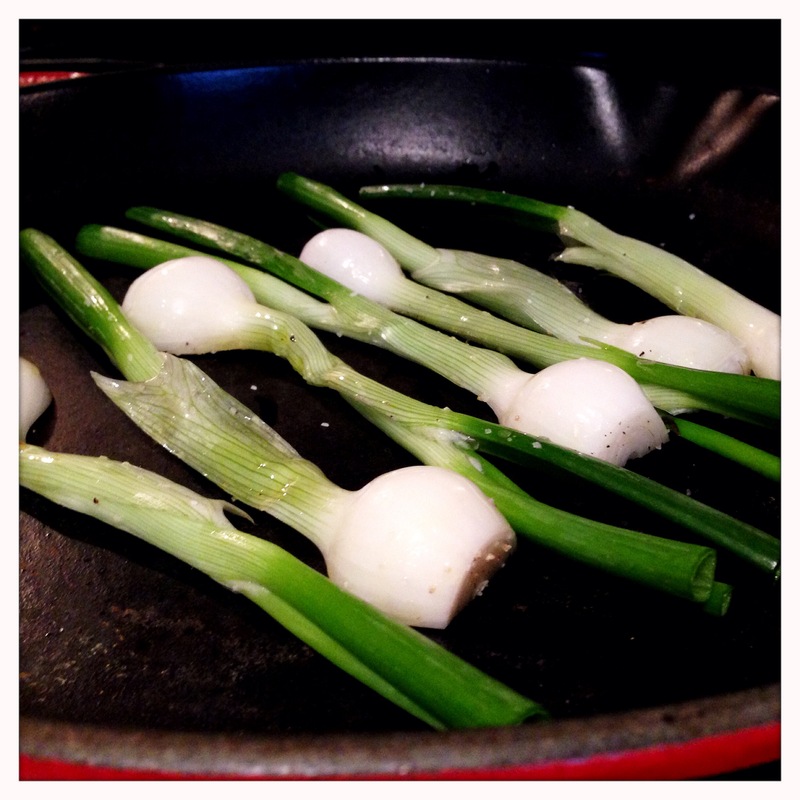 Place them cut side down onto a preheated hot cast iron skillet. Let them cook for about 7 or 8 minutes, and then start trying to remove them. They are done when they release from the pan with minimal effort, and they will have gorgeous color and flavor. Now it’s time to assemble the tacos. First off, you need to heat your tortillas. Corn tortillas should never be used for tacos without first heating them as this gives them better flavor and makes them flexible so they don’t fall apart when you make your tacos. Place them on a hot cast iron skillet for about 15-20 seconds a side. 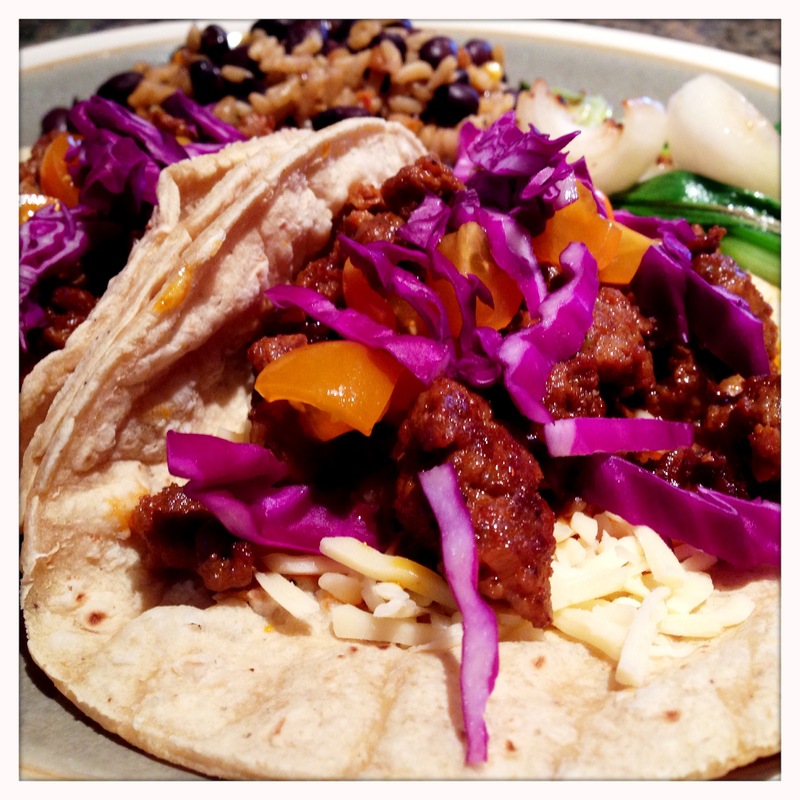 To build your taco, place two corn tortillas on a plate (corn tortillas should always be doubled). Add a little shredded cheese. I always put my cheese on the bottom so that the hot meat will melt the cheese. Add some chorizo on top of the cheese. Next, add a little shredded cabbage and some of the diced tomatoes. You can add the grilled onions directly to the tacos or plate them as a side. This time around, I served the onions as a side along with some rice and black beans, but I did place one onion into one of my tacos, and it was pretty tasty. This particular chorizo was very mild, and our little guy really enjoyed it. Chorizo comes in an enormous variety of flavor profiles and spice levels, so ask your butcher if you’re unsure. Much like my recent post on BBQ pork tacos, I hope this makes you consider using chorizo as another alternative to basic ground beef and chicken tacos. Enjoy!